This topic will show you how to configure email notifications within CloudCheckr. 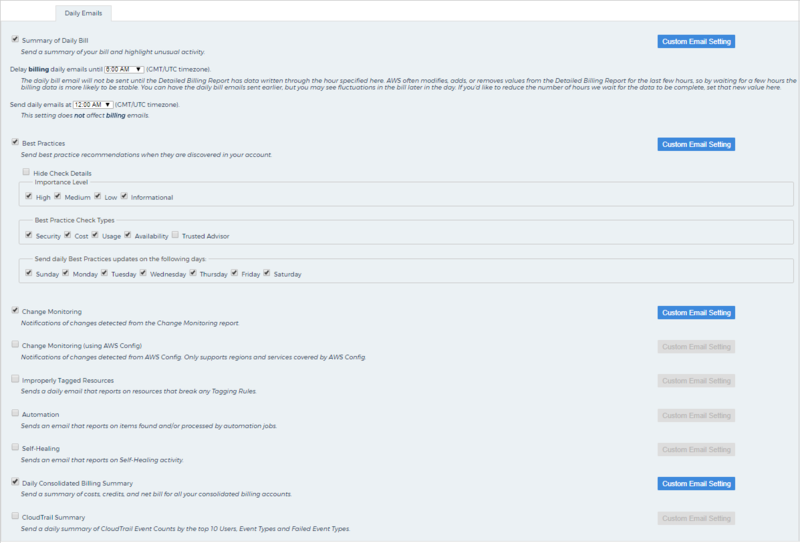 After you have added your credentials, you can configure what types of email notifications you want to send, who will receive them, and how often those notifications are sent. 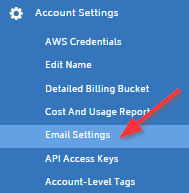 From the left navigation pane, select Account Settings > Email Settings. The Email Settings screen opens with the Alert Emails tab displayed by default. In the Send emails to text field, type the email addresses of the users who you would like to receive the notifications. If you have multiple recipients, separate each email address with a comma. The Send emails to text field is a global email address field for all the notification emails. You can override the global email setting on a per-notification basis using Custom Email Setting feature in any of the tabs. How Do I Set Custom Email Settings? Click the Custom Email Setting button next to the notification where you want to override the global email settings. The Custom Email Setting dialog box opens. Type the email address(es) that you want to override your global email settings for the selected notification. In the Alert Emails tab, choose and configure the email alerts that you want to receive. Triggered when the daily cost of your AWS account increases or decreases more than your defined percentage threshold. You can set the threshold at any value between 5–100% in increments of 5. The Alert email includes your costs for today and yesterday, so you can pinpoint where your cost fluctuation occurred. The application only sends an alert if the daily price change is $10 or more. Triggered when a service disruption occurs within an AWS region where you have resources. Triggers can include events as limited-in-scope as increased API errors to as extensive as complete service outages. You will receive an email notification for all updates and resolutions for any disruption. Triggered when there is any AWS performance or service issue in any AWS region. Click the Daily Emails tab. Choose the daily emails you want to receive and the time of the day you want them delivered. Shows what you have spent daily, breaks down your bill by AWS service, and identifies any unusual account activity. If you have the Detailed Billing Report (DBR) enabled in AWS, the application will use this data to populate the email alert. Delay billing daily emails until: Select the time in 00:00 AM/PM format if you want to delay getting the DBR until after AWS has written data for the selected time. AWS often modifies values in the DBR in the last few hours of its daily billing cycle, so billing data is likely to be more stable if you wait a few hours. If you choose to have the notifications sent earlier, you may see fluctuations in the billing data for the later part of the day. Send daily emails at: Select the time in 00:00 AM/PM format to identify the time you want receive the notifications. Time is in GMT/UTC timezone. Identifies items in your deployment that may require your attention and provides recommendations on how to fix potential issues based on industry compliance standards. The application categorizes issues by Security, Cost, Availability, and when applicable, Trusted Advisor. Only includes new issues discovered since the previous day and does not include any items that you choose to ignore within the Best Practice report. Importance Level: Select checks based on level(s) of urgency. Best Practice Check Types: Select checks based on category. Send daily Best Practices updates on the following days: Select the days of the week that you want to receive the Best Practice emails. List the items that you added, deleted, or modified in your AWS deployment since the previous day. List the items that you added, deleted, or modified in your AWS deployment using the AWS Config service, since the previous day. Identifies any resources that broke any tagging rules. Identifies any automation jobs that were found or processed since the previous day. Provides details on any self-healing activity. In self-healing automation, the customer identifies what conditions will automatically kick-off a series of corrective actions. For example, if an instance is inundated with traffic, the customer can configure the application to automatically divert resources to respond to the demand and suspend usage on the virtual tool once it has been left idle for a predetermined length of time. Provides a billing summary for all of your consolidated AWS accounts. You will receive total net bill, Month-to-Date bill, and monthly predictions based on all of your accounts, as well as an account-by-account breakdown. If you do not utilize consolidated billing within AWS, you can disable this report. Sends a daily summary of CloudTrail event counts by the top 10 users, event types, and failed event types. Click the Weekly Emails tab. From the Send weekly emails on drop-down menu, select the day of the week that you want to receive the notifications. Choose the reports that you want to receive weekly notifications on. Provides an inventory summary about the AWS services that you have deployed. Shows how your EC2 deployment has fluctuated over the past week and provides a count for each day. Includes configuration and usage details about on-demand, Spot, and Reserved instances (RIs), EBS volumes, Elastic Load Balancers, security groups, and other services. Provides details about your S3 configuration and usage, including cost, storage, total objects, and buckets. Provides details about your EC2 CPU and network utilization. Provides a weekly-aggregated version of Best Practices recommendations. Send monthly Best Practice emails on selected days: Select a day or days from the drop-down list or click the binoculars to filter the list of days and/or select multiple days you want to receive the monthly notifications. Click the Monthly Emails tab. Choose the monthly emails you want to receive and the day you want to receive them. Provides a summary of your monthly bill and identifies any cost anomalies such as spikes in spending. Provides the final monthly summary only after AWS closes out the month, which is typically the 5th or 6fh of the following month. Provides a monthly summary on the Center for Internet Security (CIS) benchmarks, which identify best-practice security guidelines for government, business, industry, and academia. Send monthly emails on selected days: select the day of the month on which you want to receive the Best Practice email notifications. Click the binoculars to filter the list of days and/or select multiple days you want to receive the monthly notifications. Provides a monthly-aggregated version of Best Practices recommendations. Send monthly Best Practice emails on selected days: Select a day or days from the drop-down list or click to filter the list of days and/or select multiple days you want to receive the monthly notifications. The amount of time it takes to complete your snapshot depends on the size of your AWS deployment. As soon as your initial snapshot finishes, the application will send you an Inventory Summary, S3 Summary, and if configured, a Best Practices Report email, so you can begin reviewing the data within your account.